What Sharknado tells us about American politics. 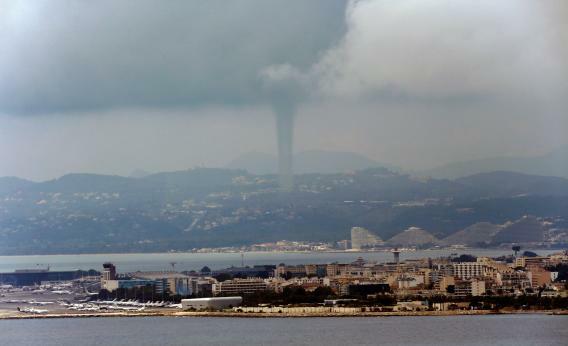 Look closely at this June 9 waterspout near Nice, France, and you might see some sharks. Like most people in my Twitter family, I watched and tolerated the Syfy original movie Sharknado this week. (A movie critic pal had a screener, which inspired a beer-and-pizza-and-live-snark gathering.) On Thursday night, as the channel played the movie live, it definitely seemed as though an entire social network was in the grip of sharks being tossed at Los Angeles by a tornado. And yet, according to Businessweek’s reporting, the movie was something of a bust. According to the Los Angeles Times, Sharknado was watched by only 1 million people, which makes it a bust, even by Syfy standards. Most Syfy originals have an average viewership of 1.5 million people, with some getting twice that. This offers a valuable lesson, if we want to learn it. Twitter, as read by the pundit/journo class, is a skewed and friendly field of public opinion. What happens on there doesn’t necessarily happen anywhere else. Yet whatever happens on Twitter between politicos becomes huge news. During the Massachusetts special election for Senate, Politico published 1,800 words on the trash-talking war between party Senate campaign committee flacks. “Even the most seemingly minor development in a Senate race — X Senate prospect decided not to run in Y state — can spark a sandbox spat,” wrote James Hohmann. The result in that Massachusetts election was basically what someone would have predicted two or three months before it started. Twitter absolutely has the ability to create quick national awareness about a local piece of legislation (Texas’ SB2) or trial (Kermit Gosnell), and that influences coverage. But do Twitter frenzies have any impact on political campaigns? I’d ask how many female voters swung to Mitt Romney because Ann Romney was so quick to tweet about Hilary Rosen’s insult of her. Remember that story?